This set for the money can not be beat. The copper bottom evenly distributes the heat and it is tough. I take river sand and scrub it out and it shines like new. 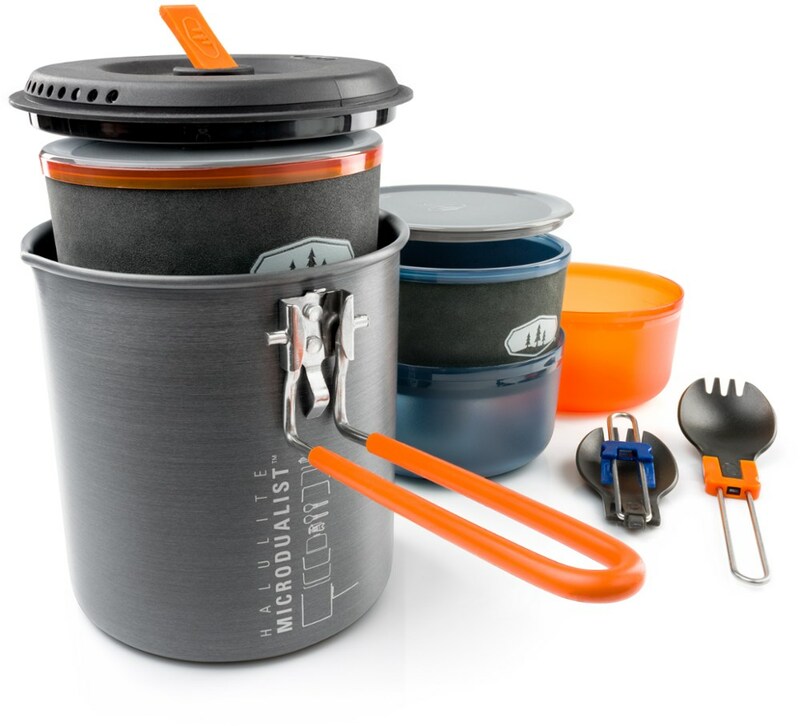 It is lightweight and my stove fits inside the cup nested all together in a stuff sack. Love it. I lost mine a few years ago to a thief and searched till I found a new set again. 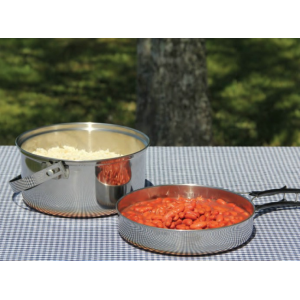 If you love cooking at home you will feel right at home using this product in the woods. I backpack with it and kayak camp with it all the time. I can cook real food on site and never take that dehydrated stuff. The two pots work for sauce in one and pasta in the other. 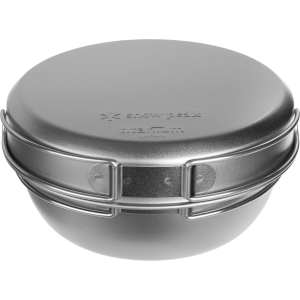 And the fry pan works as a plate or to cook frozen chicken breasts over a bed of coals. Ever had fettuccine Alfredo with sauteed chicken on the bank of a river after a long day on the water?? Heaven. Buy it and try it! Welcome to Trailspace, Jeremy. Thanks for the review! You can take everything and have it in one small kit that everything fits and locks into. A great set. I was a little skeptical based on the cheaper price but once I received them I was pleasantly surprised. They are light weight, just a little heavier then aluminum but a heck of a lot more durable. I might end up replacing the cups with titanium ones though. 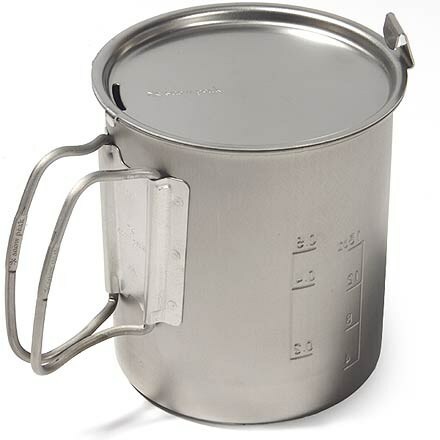 It would be nice to be able to boil right in the cup for tea or coffee (and not worry about melting or breaking). Also, I heard some customers were complaining at Cabela's about a "Contains Lead" sticker on the bottom. I did some research and here is what I found. First, I should say that I bought this under the name of Ledmark. It came in a box that said Outback. 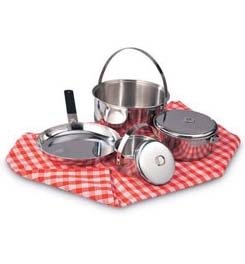 I have noticed that many suppliers have this basic set. This is a thin SS set. The copper wore off after 3-5 trips. The cups have marks for measurements. The handles seem flimsy, but with some care and commonsense should hold up for years. As of now I see no reason to upgrade to another set. as this one does cook well. and I take care of my camping gear. 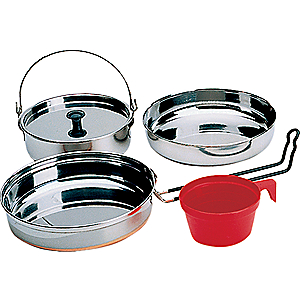 It is a very good inexpensive set, light weight, and nest together well. I like the folding handles. If your cash is tight this is the set to get. 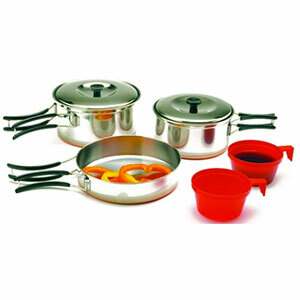 The Texsport Stainless Steel 2-Person Cook Set is not available from the stores we monitor. It was last seen July 9, 2013	at Campmor.